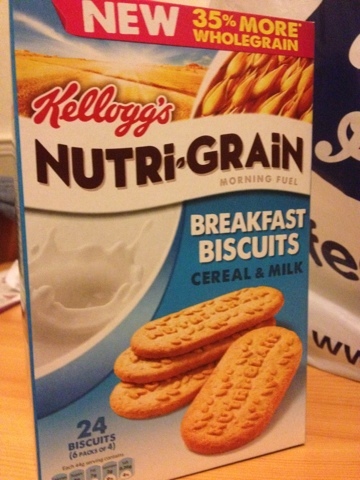 Following on in the theme of things that can't possibly be that good for you but positioned in the breakfast category we have Kellogg's own breakfast biscuits. Once the masters have started making biscuits for breakfast we have to think that Jonny Vaughn has won and these are a real thing now. Where as the belvita biscuits are essentially cereal compressed to the shape of biscuits these are really just highly nutritious biscuits. They are essentially baby-rusks but for grown-ups with out the time to pour milk. Actually dunking these in milk may be a genius idea. Must try that. The biscuits themselves are very luxurious and nicely large. Also they come in portions of four, meaning no-one can accuse you of being greedy for eating all 4 of them. The texture as mentioned is much smoother than the thick grains of the belvita which may suit some people. I think I preferred the big seeds though. The flavour is great and they have clearly gone all out to make sure these are on TV and in the special offer section to get us hooked. I agree, expensive considering what they actually are! Still, the idea of grown up Rusks has got me excited...not that still like to eat Rusks *cough* think I might have to try these regardless! People buying Rusks as grown-ups is one of those things that once one person admits to it you find that loads have people have done it! Surprised it's taken this long for someone to find a way to capitalise on that gap in the market.